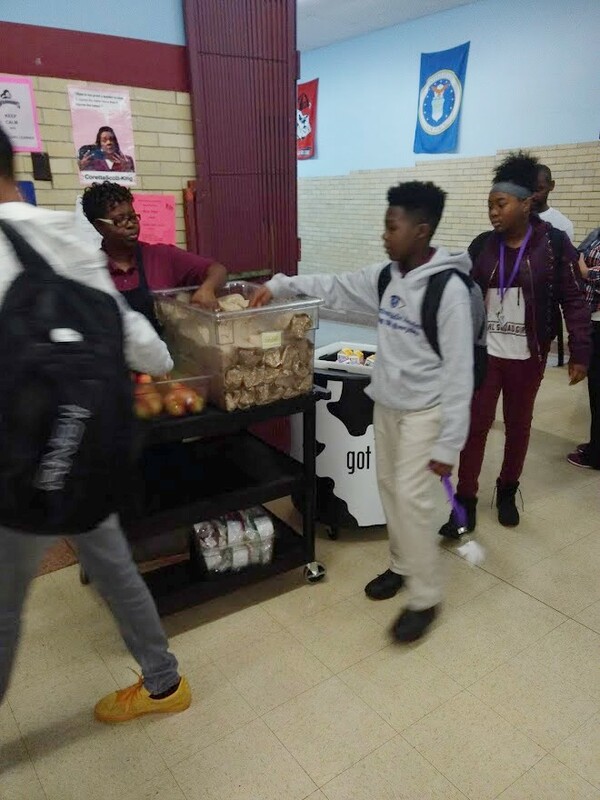 “Having the support of teachers, principals, counselors especially with nudging students to get breakfast helps,” said Sonia Cantres, Perspectives Charter Schools Business Office Manager. Perspectives Charter Schools, a network of middle and high schools started its Breakfast After the Bell program about 3 years ago when Cantres started. Tasked with bringing breakfast participation from 55 percent to 85 percent Cantres implemented Grab ‘N’ Go to the Classroom. Cantres got the staff on-board and put a system in place that works for their schools. The Auburn Gresham Campus is made up of three schools: one middle and two high schools. Students are distinguished and the breakfast count is done by which door they enter; having one door for middle and another for high school students. The high school students are met at the door by their principal and college counselor. The middle school students are met by their dean. Students are then asked about the essentials: If they have their ID and to grab a breakfast. After grabbing a bagged breakfast, fruit, and milk/juice students head to their classrooms to eat. Breakfast Nudges are subtle acts of positive reinforcement that schools can add into their morning routine to increase breakfast participation. This resource outlines how nudges can work in your school.